Elevator, Master Suites, Jacuzzi's - steps to the Beach! 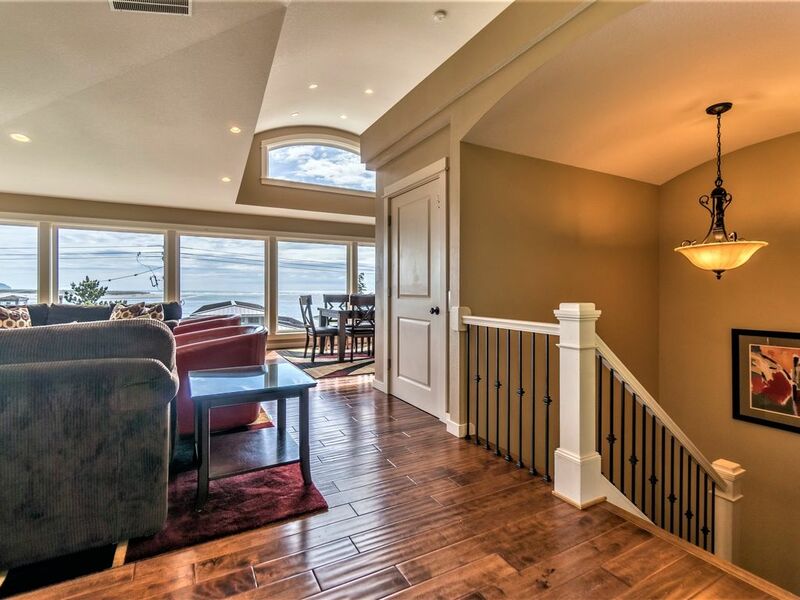 3 bedrooms, 3 bathrooms, sleeps 12 with incredible Ocean & Bay Views! • Newest construction in Happy Camp, Street of Dreams quality beach house with its own Private ELEVATOR servicing all 3 floors…yes, its own Elevator with a phone! • Spectacular Bay and Ocean views. • 3 bed, 3 bath including 2 Master Suites each with a private Jacuzzi, separate showers and custom tile/stonework throughout. Deck off master suite. • Open floor plan with vaulted ceilings, fireplace and floor-to-ceiling windows taking advantage of the fabulous views. We recently added high-end blinds that can be pulled up to maximize the incredible views or pulled down to provide complete privacy. • All furnishings throughout the entire house are brand new and high-end. A summary of some of the high-end furnishings throughout are: King-size bedroom set, Queen-size bedroom set, Bunk bed, Full-size bed, (2) Large “Main Street” high-end sleeper sofa’s, swivel accent chairs, large dining room table overlooking the Bay and Ocean, bar stools at the kitchen eating bar, new 65” UHD Samsung SMART TV above the gas fireplace, each Master bedroom has its own 55” high-end HD TV's, high-end washer and dryer, stainless steel gas grill on the deck overlooking the Bay and Ocean! Since this is a custom-built home with all new furnishings, we ask everyone to enjoy the beauty and comfort but please be gentle and care for it at the same time. Pets are on a case-by-case basis. What we love about the location is the fact that you're right at the junction of where the Pacific Ocean meets Netarts Bay and the scene is always changing, sea lions bask in the sun and you can build a bonfire right there and have fun crabbing from the shore, clamming, fishing and enjoying your favorite beverages at sunset. You may want to bring a propane hibachi grill if you have one. It works well for grilling oysters on the beach. You can typically get oysters for around $6.50/dozen at the local grocery store on Crab Ave in Netarts (one block from the house). When you grill the oysters, you can dab a little BBQ sauce and even a little hot sauce to give it some zest. Suggest washing it down with a refreshing IPA or Pinot Grigio! outdoor shower, Hot & cold running water, great following beach fun! Enough room to park 4+ cars! Elevator services all floors and even has a phone! Dining area is located along the wall of windows (floor-to-ceiling windows) overlooking the Pacific Ocean and Netarts Bay. Large HD LCD TV's in living room and both master suites. Wireless Blue Ray CD player has full access to Pandora and popular music applications. Wireless Blue Ray CD player has full access to Netflix and other popular video applications. Boats available for rent at nearby facilities. (2) One deck off the main living level and another deck off the 1st Master Suite for privacy and that romantic get-away! Free dual band Wi-Fi available for your internet needs. The Sand Castle was a great place to stay to enjoy a really beautiful, sandy, uncrowded Oregon beach! The view from the Sand Castle is stellar - big ocean, pounding waves out beyond the sand spit, lots of sky and weather, and seabirds. The kitchen was delightfully spotless and convenient for meal prep, and the entire house was clean and comfortable. Thank you, Nick! We had a great time at your lovely house on Netarts Bay. The house is very comfortable and well stocked with things you may need. The owner is very responsive to help with any questions. The beach is just a short walk from the house. Thoroughly enjoyed our visit! We had a great stay, clean place, great views, close to beach and had excellent weather!! We will come back again! Clean, spacious, and close access to the beach! The home had a beautiful view of the ocean and loved how well equipped the kitchen was. First, but not most important, from booking to check out, it was simple. Nick was easy to reach, kind, generous and had clear instructions printed inside. The house was lovely and comfortable with dreamy views of Netarts Bay, bar and ocean. It was a bit stormy at times so we got to watch the sky and water colors change from steely gray to aquamarine to choppy blue with waves like white-maned horses galloping through the mouth of the bay. The kitchen was well stocked with dishes, towels, spices and plastic wraps. The beds and bedrooms were comfortable. There are quality finish materials in the house. Jacuzzis in the two masters. The three TVs were big with high-speed internet and multiple options for channels through Prime and other apps. Very strong and steady WiFi signal. The top floor gas log fireplace was lovely. My wife and I each reclined on our own sofas in front of the fire and TV at night. We walked on the beach in light snow with blue sky sun breaks and glowing wave crests. We saw five Eagles soaring between trees on the cliffs and took amazing photos of the windswept beach and fallen trees with large off-shore rocks in the distance. Not to forget, we love the restaurant and bar called The Schooner which is 20 minutes walking on the beach or a 5-minute drive. Their food has never disappointed. Whale watching - Gray whale can be seen year round, but peak migration periods coincide with winter, spring and summer breaks.